With Asia's third-largest economy making up for 15% of Hyundai’s global operations, the local unit has been given regional responsibility to decide on product portfolio and investment plans. NEW DELHI: Hyundai Motor is likely to give its Indian unit the responsibility to manufacture “compact smart electric vehicles” for emerging markets. The Korean automaker is also considering expanding production capacity in India after almost a decade. The second most important man at the Hyundai Motor Group announced at the MOVE Summit that the company would launch three “smart and economic” electric vehicles for the Indian market — this may call for investing in localising battery and components production. With the plant at Sriperumbudur on the outskirts of Chennai operating at more than 95% capacity, Hyundai is considering expanding capacity in India. It has created some room for local supplies by diverting certain exports to production bases elsewhere and through other means, but that is unlikely to be enough to meet the expected demand beyond two years for the maker of the Verna and Creta. "The prospects are very bright in India; the country is a strategic location for Hyundai. We are thinking about the second phase of investment in India and we have started planning for it," Euisin said. Hyundai has already confirmed the launch of the Kona EV in the second half of 2019. The three EVs that Euisin announced the company would be introducing in India would be in addition to one with a hydrogen fuel cell. He complimented the Prime Minister for organising the Global Automotive Summit and said the event was a step in right direction to move towards smart mobility. The company is already in the midst of a product onslaught, with 8-9 models in the pipeline and an investment of more than $1 billion. It is very close to launching a mass market compact car and the sub-4-metre QXi SUV, which will give Hyundai a significant volumes spike. According to several people in the know, the small car and compact SUV may potentially add 15,000-16,000 units to the current average monthly sales of about 45,000 vehicles. 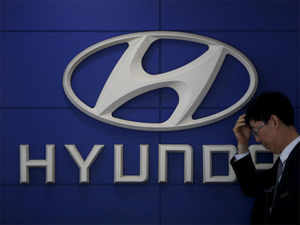 The company’s India managing director, YK Koo, had announced that Hyundai would aim for 1 million output by the end of the decade.